Under the red awning funky multicolored lights twinkled, music thumped, and the restaurant bustled with activity. Servers carrying precarious trays of beer squeezed in between large groups of friends guffawing at each other’s tales, families laughing at the fathers who were trying to get down with the beats, women on girls’-night-out leaning close together to be heard over the din, and… me sitting by myself in the center of it all. 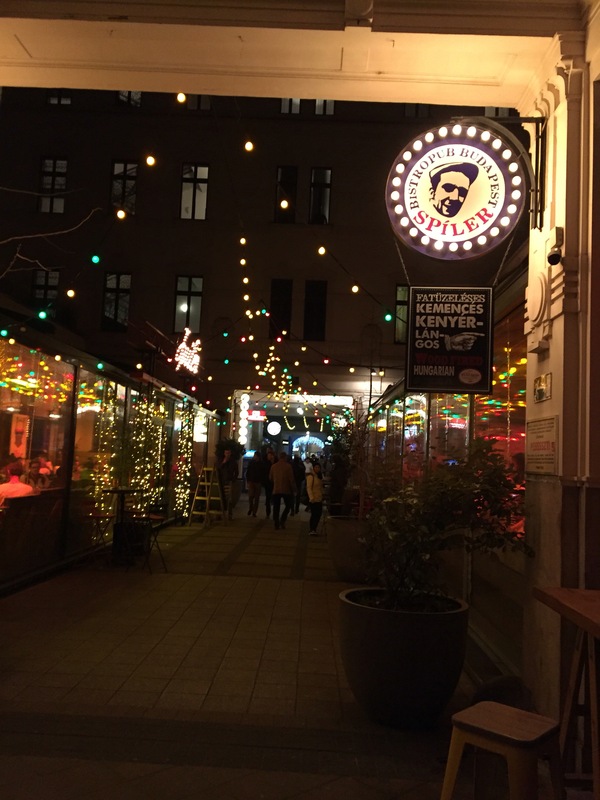 After the hostess faltered after I held up the “number 1” sign to signal that I was dining alone and her attempt to seat me at a table off to the side by the kitchen, it became apparent that at Spiler’s in Budapest’s trendy Gozsdu udvar that people never ate alone. Or, more specifically, no one went to Gozsdu udvar, an alley of funky cafes, hip bars and eateries, alone. But I had selected my own company, and I had selected this place for dinner, and I was determined not to be cowed by the raucous environment and the fact that in my solitary state, I did not belong. After I gave the hostess a look saying, “no one puts Baby in the corner”, she seated me at a table for two in the center of the action. I could watch everyone. Everyone, I realized, could watch me. I had a decision to make: sit there in discomfort or decide to own it. It was my very first solo vacation in a foreign land; I was supposed to be having fun. Instead I was like a shrinking violet, apologetic for bringing a disease that one wants to get: the prospect of loneliness. But I was alone by choice and I wasn’t lonely. I decided to own it. Squaring my shoulders and leaning back in my chair, I looked about the room like I owned the place. 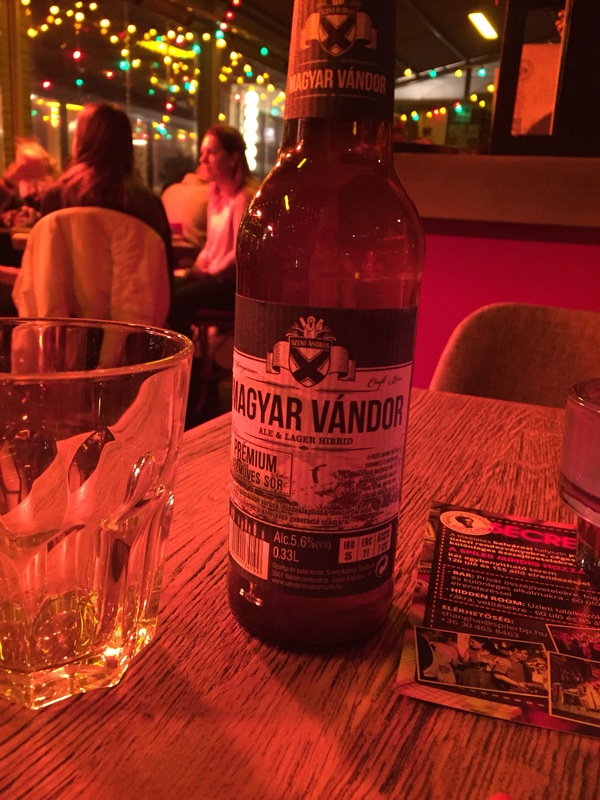 I ordered my food with confidence and selected the Magyar Vandor Ale as if I did it everyday. I took out my journal and wrote. People who are writing look important. They have thoughts. Important ones. So much so, they should be recorded. 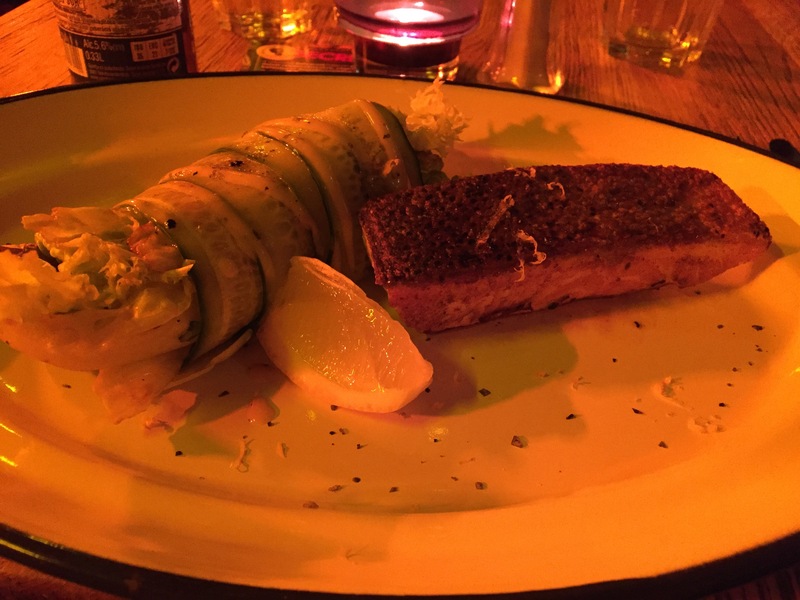 So I wrote down my very important thoughts of what I ordered for dinner (salmon with cucumber salad). I made eye contact and directed the servers to me when I needed important things. Like dessert. “See?” I projected to everyone, “I eat dinner alone all of the time and I like it.” Yep. Everyone could watch me. If they wanted to. It took me awhile to realize that nobody wanted to. They had other things to focus on: their companions, their food, beer, and trying to hear over the noise. The only one watching me was me. The problem wasn’t the restaurant or the atmosphere or the other diners. It was me and my decided lack of self-confidence. 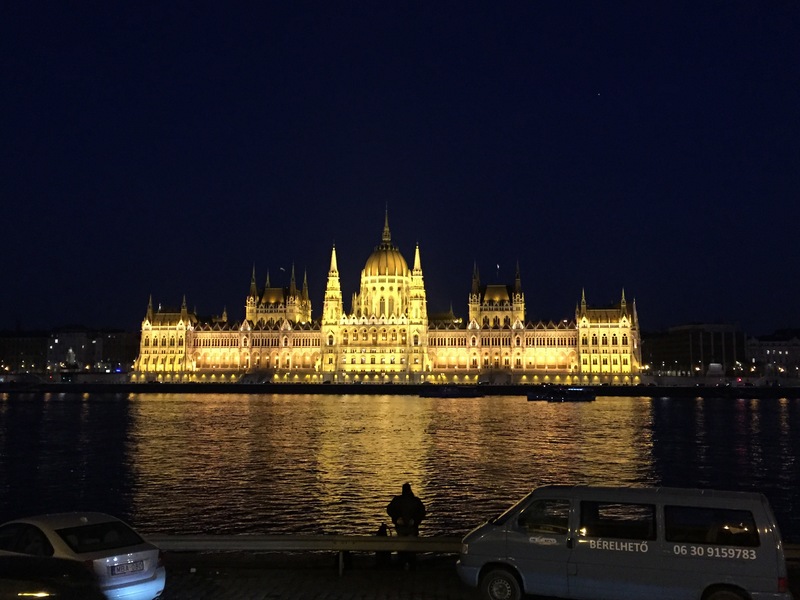 It didn’t matter if I was alone; I was a paying customer, and everyone treated me well and were very helpful, including sharing what they thought I should see in Budapest. I alone had the problem with my act of being alone. Dining at Spiler’s reminded me that everyone has their own concerns; that if I had friends or my husband with me, I would have never eaten there– it was too loud; that I chose to be alone, chose my own company, and therefore, in order to feel like I belonged, I needed to accept myself; and that when I need confidence, I could always fake it. Looking south across the Danube under the grey clouds sat Gellerthegy (Gellert Hill): dark, dead, unwelcoming. 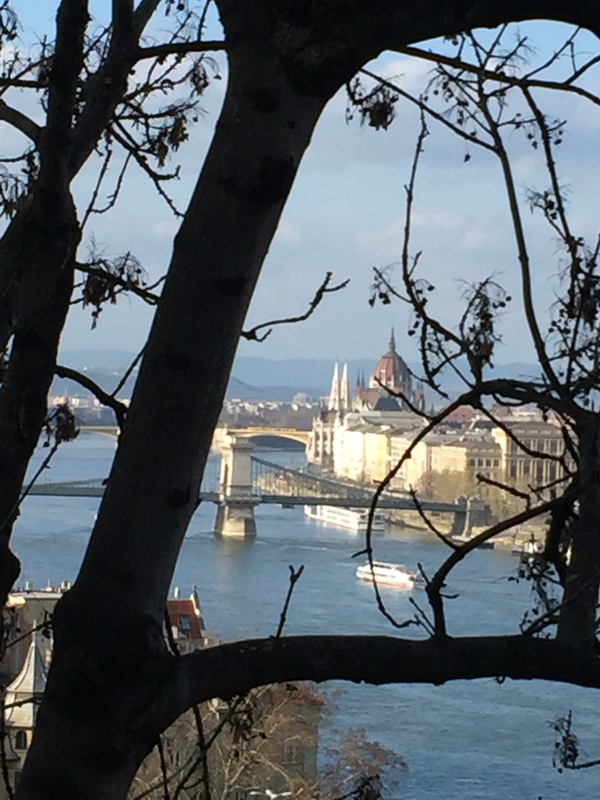 Budapest in March, unlike California with its early buds and blossoms, still slept in its winter slumber. Although it sits atop both the city and the “things to see” list, I wondered if it would be worth the climb. Was really now the time to see it in its barren tree glory? Six months before I decided that I would visit Budapest. By myself. Partly to satisfy a life-long dream of exploring a foreign place alone and partly just as a personal challenge, could I do it? Could I handle a language as complex as Magyar that added numerous “k”s and “z”s to words? The forint whose bills started at 500? Could I navigate my way through streets that were unpronounceable? Could I spend a week in my own company? Budapest was easy. Ridiculously so. First, basically no one else in the world speaks Magyar, but almost everyone in the world (it seems like) speaks English. English was their default. 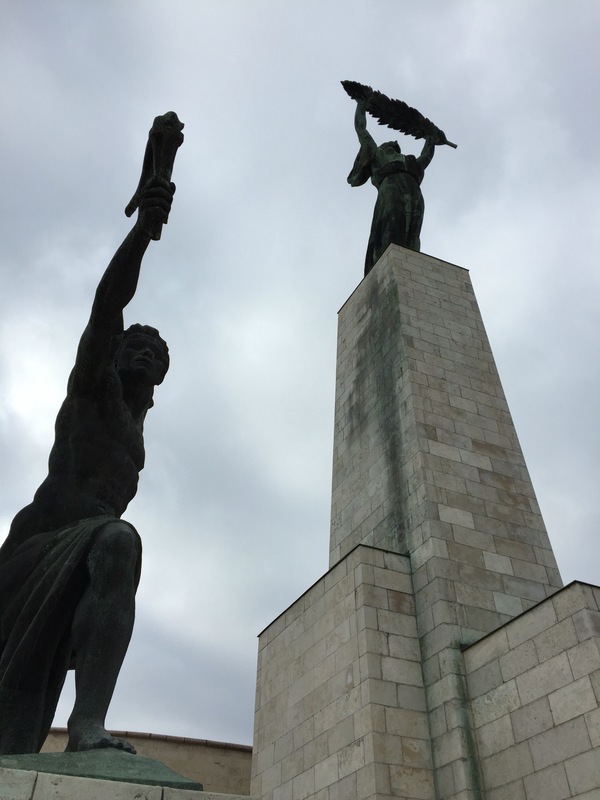 Most Hungarians were fluent, and if not, knew enough to get by. The menus were translated. At first I felt the thrill of ordering off a menu I couldn’t understand and then my waiter came by and flipped it over– to the English side. On the taxi ride from the airport to my hotel, I acquainted myself with the Hungarian Forint, and by the time I reached my destination, I had the amount ready to pay him, tip included (10% as is customary). Because I spent so much time researching my location and mapping out how to get places beforehand, once I checked in I set off to the Chain Bridge and Buda Castle without assistance. My own company was a bit more complex. If Budapest’s default was English, mine was go, go, go, plan, plan, plan, do, do, do. My energy lately had been spent outward, unfurled in all directions. Solving problems, planning lessons, listening, cajoling students, cajoling adults, grading papers, leading, following, going to meetings, commuting, organizing, and on and on. Just “being” fell to the bottom of the list. More frightening was looming feeling that I was not enjoying basic pleasures anymore. Everything felt like something to do, as if I was on autopilot through my life. My creative zone eluded me and even sinking into a good novel seemed out of my grasp. Even on a trip by myself where I could be my own boss, I fell into this default mode. Following my itinerary, I made sure I saw the sights that were “worth it”. 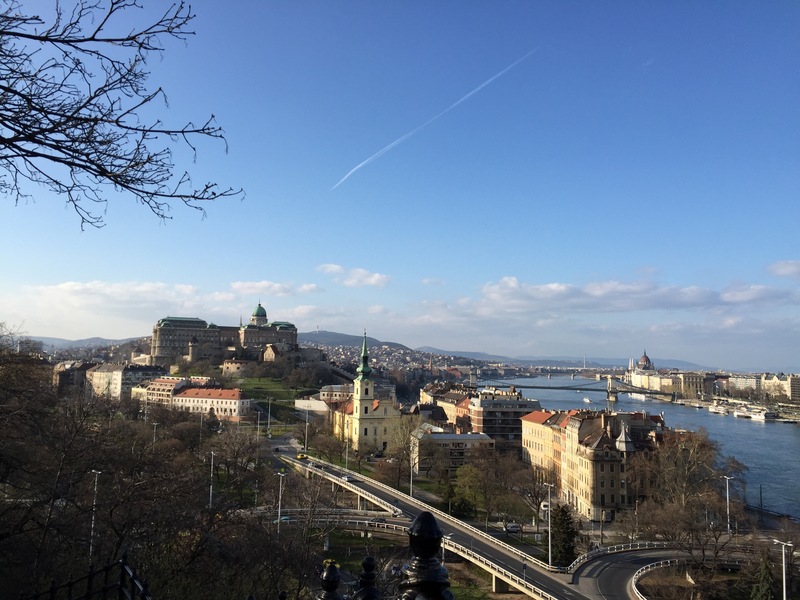 My first day of exploring Buda Castle, St. Matyas Church, and Fisherman’s Bastion was quite nice, but my second day making the trek to City Park, going to the zoo, walking around the Jewish Quarter, and then going to the Opera left me feeling flat. These were things that I felt like I “had” to do. Maybe it was because all of them were on the Pest side of the Danube: the flat, more developed and trendy area devoted mostly to hip clubs and shopping. Gellerthegy called to me, but I resisted. There were other things to do and see, like take a tour of the stunning Parliament building. Surely this was more important than climbing a barren hill. Then I thought about being part of a tour group and following close behind the guide to hear. Then I thought about other people in the tour. Then I thought about the time schedule. Then I realized that I didn’t want a schedule, other people, or a guide. In fact, I was perfectly happy looking at the outside all lit up at night from across the river. That was enough for me. What I really wanted to do was walk up a hill. The next morning was cloudy as I struck out down Karoly Utca to cross over to the Buda side via the spare, white Elizabeth Bridge. Before I could reach it I was distracted by the shops on Vaci Utca and meandered down the narrow street of knick-knacks and souvenirs. 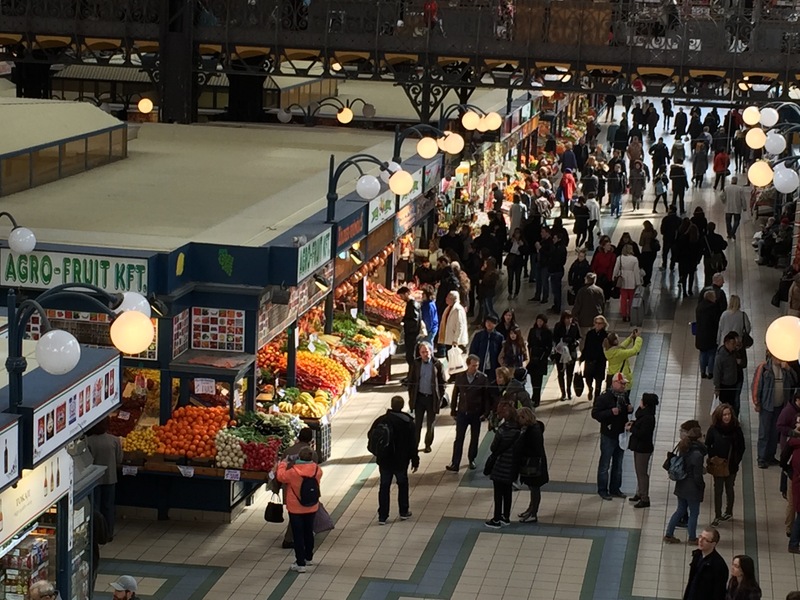 It deposited me in front of the Grand Central Market, Budapest’s largest market. The first floor was rows of fresh fruits and vegetables, rich-smelling smoked meats, cheeses, pastries galore, and paprika stands. Tucked in the back was a dairy stand selling fresh yoghurt, my favorite treat. I purchased a cup of yoghurt and a cinnamon apple strudel and had a little picnic on a park bench. 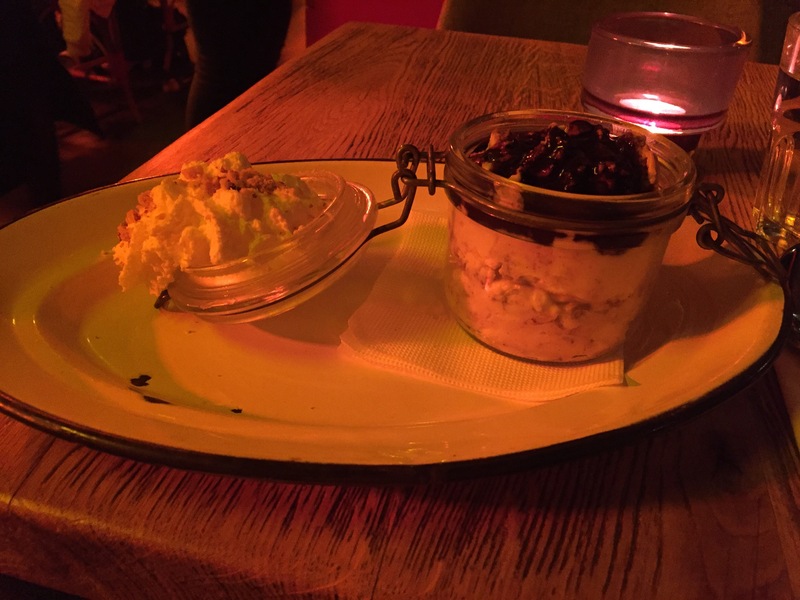 The yoghurt was light and creamy with just a hint of tang; the strudel was warm and crisp, just sweet enough. Sated by my treats I made my way upstairs to the maze of shops selling wooden products, Rubik’s Cubes (invented by a Hungarian), dolls, purses, glasses, every kind of good that could feature the word Budapest on it. 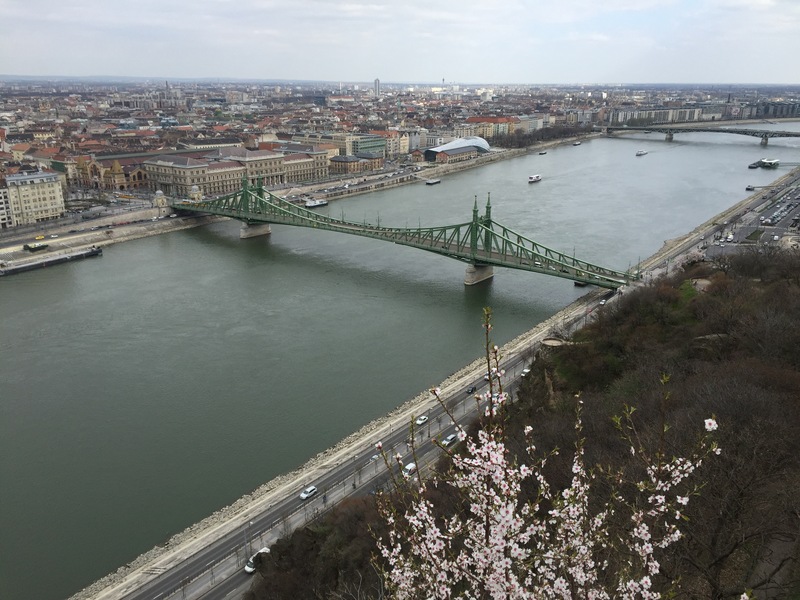 Because of my detour I crossed the Danube on the green Liberty Bridge that placed me at the base of Gellerthegy. I began my ascent at my own pace. The hill was quiet with only a few people about. The trees naked limbs cast a sharp silhouette against the clouds. 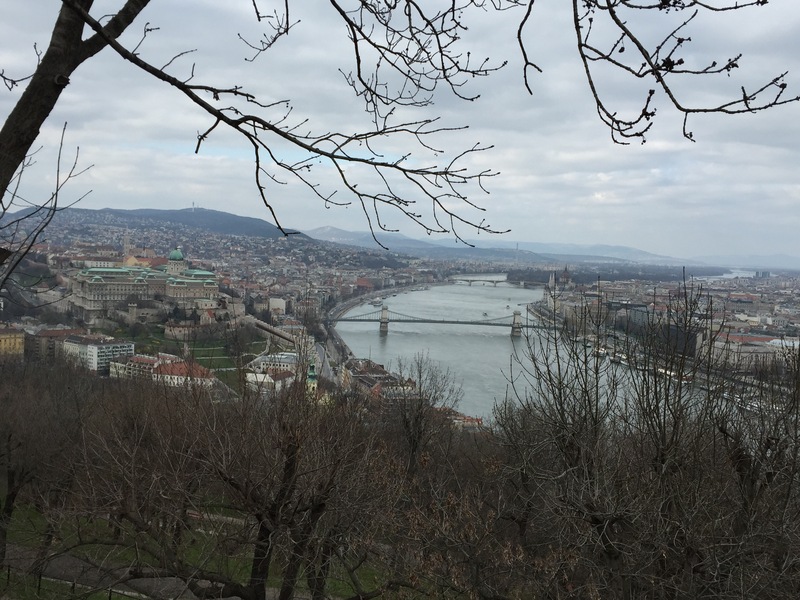 Vista points along the way allowed one to stop and soak up the panoramic view of both sides of the city: the bridges lacing the Danube; Margaret Island parting the river; the hills rolling into Slovakia; Parliament and Buda Castle just dots on the landscape. My pulse quickened as photo opportunities revealed themselves to me. Slowly with heightened awareness, I let my surroundings speak to me as I photographed the scenery. Time, people, concerns all fell away as I entered a quiet space of focus. Everywhere, it seemed, called to me. 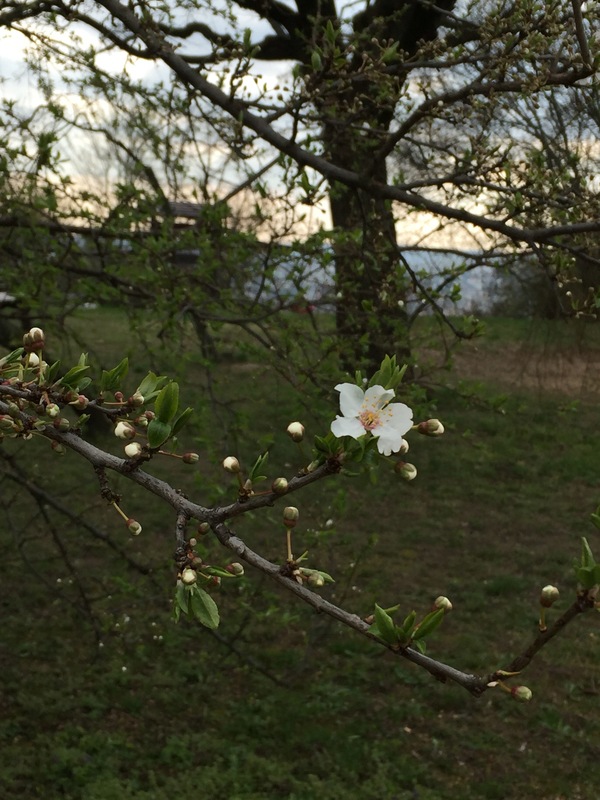 Shyly emerging from scattered branches, flowers dotted the hillside. I walked up to the Liberty Statue at the top of the hill of a woman holding up a palm leaf to the sky. 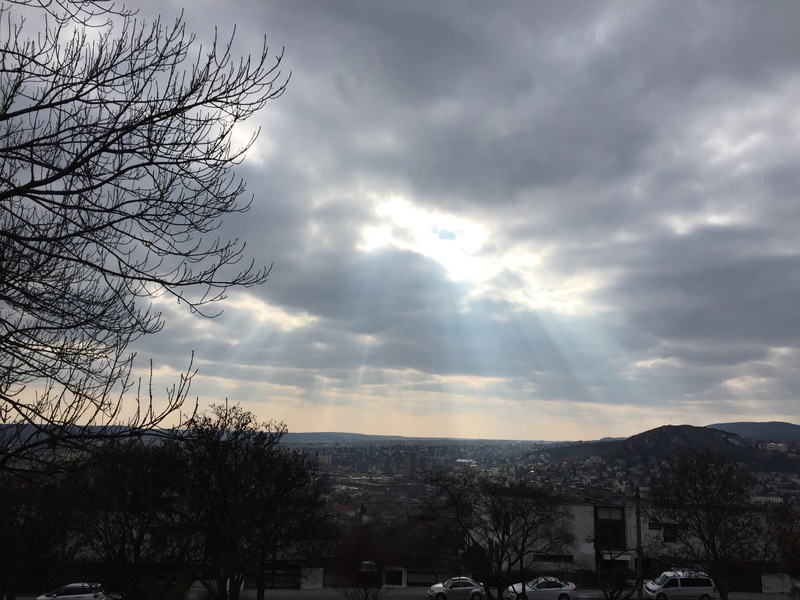 The clouds dispersed to allow the sun to streak though, shining gentle rays of light upon all, revealing the hill, the flowers, and myself coming back to life. It was quite a scene inside the Notre Dame Cathedral. Artisans carved stones, men sawed wood, workers lifted beams up with pulleys, others stoked the for for iron work, and the horse pulled carts across the workspace. Out of sight were the artists assembling the stain-glass Windows and beginning the multitude of paintings. 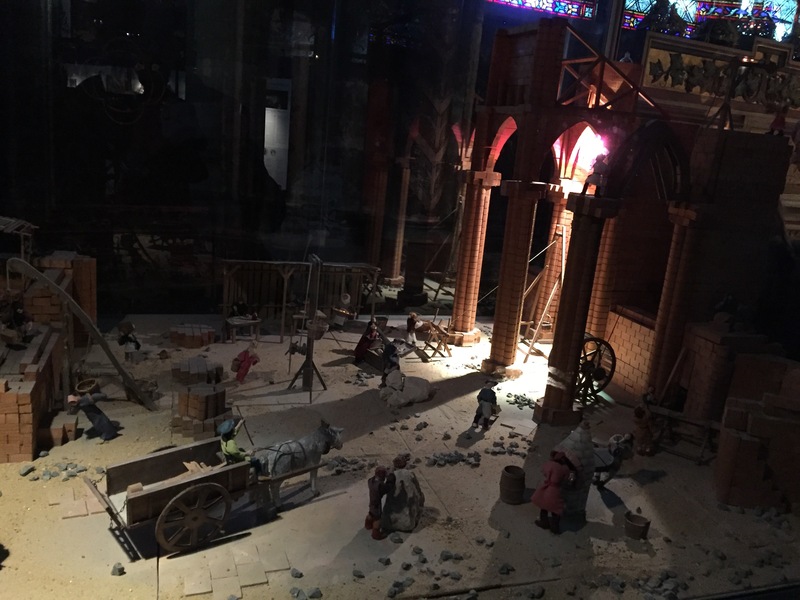 The diorama showed how people worked together to build this great landmark; there were centuries of these men. As a twenty-first century visitor snapping pictures of it on my iPhone, I wondered, where are they now? The men who helped build Notre Dame are long buried along with the world that needed skilled artisans. Today’s world has little need of men who wield tools and know their craft to create things of beauty. Much of anything now can be pre-fabricated and made with machines. Yes, we need people who know how to fix machines and build houses, but what do we have for our artisans? What roles do we have in our society that fosters this creativity and hands-on knowledge? Paris abounds with work from another time, but where did their descendants go? What legacy did they receive beyond a big, beautiful, buttressed cathedral? Some things never change. Montmartre, for instance. It’s always been a home to the bohemian set and rough around the edges. The first shots between the Communards and the Versailles government were fired there in 1871 after the debacle of the Franco-Prussian War. Escaping Baron Haussmann’s demolition and redesign, it holds on to its old world Parisian charm of quaint buildings; some of its inhabitants make one hold on to her purse. Tightly. 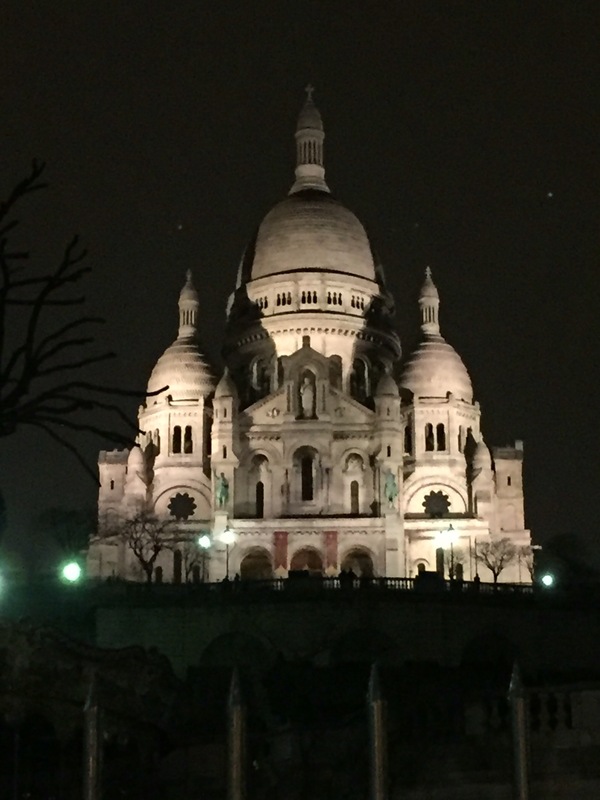 On top of the Montmarte Butte sits Sacre-Couer, the stark and majestic cathedral that overlooks the city: the church of the clouds. Majestic and otherworldly, it provides a sharp contrast to the gothic scrolls and spires of Notre a Dame and St. Chappelle. 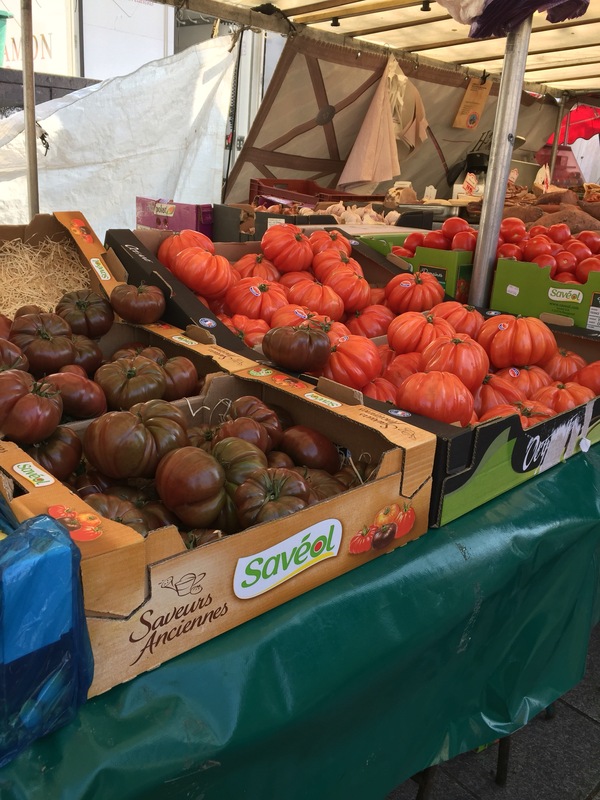 It’s power is hidden from sight as you exit the Ligne 2 Anvers station and walk the narrow cobblestone streets lined with souvenir shops and falafel places. At the base of the hill young men spread their wares on the ground hoping for a gullible tourist. The stairs that ascend to the church are littered with Heineken cans, orange juice containers, and drunken reveled playing loud music. Beneath them lies the Paris skyline– pinkish gray in the setting sun; above them, behind heavy wooden doors, a haven of calm. The priest intoned his service and prayer as nuns sang behind him. The congregation made up of visitors and locals peppered the pews. Visitors walked quietly around absorbing the understated beauty. Unlike most European cathedrals, the colors and decorations were muted. The mosaics represented biblical figures as common men– people like you and me. These scenes inspired comfort and compassion; the God that ruled here was a compassionate and forgiving one who realized our humanity. He did not inspire fear, damnation, and guilt. Everything prompted reflection and care– from the careful placing of the tiles in the mosaics to walls of blank stone. It allowed space for one’s own thoughts, a space to process the narrative of guidance, support, and becoming better people; how can we make the world a better place? These thoughts weighed on my mind as we walked back into the night. Our hearts dropped when we entered the Metro. She was huddled on the seat, face tear-stained and turned to the window, her extensions falling from her hair, her boots and fishnet stockings ripped and disheveled. It was clear that she was not in a good way. As the doors closed and we pulled away, she sat motionless. At the next stop a man and two women entered our car, they looked at her as they walked by. A few seconds later the man walked back wearing a look of concern. He knelt to her and asked if she was okay. She didn’t respond. The two women came over to her, gently placing their hands on her shoulder, quietly talking to her without judgement. One went to the box to contact the conductor; we could hear the conversation, but we couldn’t understand what was said. But at the next station a Metro worker was waiting for our car. He, too, bore a look concern and was ready to assist. She did not want to get off the train, and the train moved on to the next stop. The women and the man stayed with her, a stranger to them. At the next stop they walked off together, and one of the women used the emergency phone to call for help. They were still with her as we pulled away. At the open air market in an esplanade near the Bastille monument, I purchased a bouquet of miniature daffodils to emulate the French who are often seen carrying flowers. They were bright against my teal coat as we walked down Rue St. Antoine to the Ile-St. Louis to the St. Regis, our lunch destination. As we entered, a waiter greeted us and smiled at my flowers. “Ah! For me?” he asked. “Oui!” I responded, holding them out to him. He took them and lovingly placed them in his front shirt pocket, patting them for safe keeping. We laughed and he returned them back to me. We entered the Luxembourg Gardens, and even though there were no leaves on the trees, the park was full of families enjoying the bright afternoon. Parents spent time with their children who were playing with the boats, climbing on the playground, playing soccer or basketball. The kids were smiling and laughing and shrieking with glee. None was having a fit or misbehaving or on a cell phone; the parents were present and doting, but overall unconcerned. None hovered. Parisians visited on park benches, played pétanque or tennis, others read in the quiet corners. The feeling of community overswept us. The Church of St. Sulpice differed from other cathedrals; it was care-worn and showed its age. We wandered from alcove to alcove until we were approached by a tiny elderly lady in a purple cap. She scurried toward, eager to show us, complete strangers, the alcove for St. Joseph. Religious paintings depicting Joseph learning that he should wed Mary surrounded the sculpture of him holding the baby Jesus. He differed from the rest as his face beamed with light. “I asked the church to put a light on him, and every night I prayed and prayed.” She pressed her hands together, looking up towards God. “Then my prayers were answered. They put in a light for him.” She left us quickly as she came. We realized that this was the first time we had ever seen Joseph with the baby; it’s always Mary. Would we have seen it if she didn’t surreptitiously share her joy with us? This is the story of Paris: a city full of people enjoying life, being present, and taking care of one another– even those who they do not know. Everywhere we have gone, we’ve been met with kindness. The city has been shaken with the recent attacks, but they have responded with generosity of spirit. Instead of striking them with fear, it has given them greater impetus to live the way life should be lived: with care, concern, and compassion. Fortunately, the gods of Amazon took pity on my poor soul and deluged with my inbox with recommended reading about Paris, where I am headed today. That is how I ended up with a copy of Joan DeJean’s How Paris Became Paris: The Invention of the Modern City. It was with great joie de vivre that I tore the book out of the box, ready to devour its contents. I flipped open the book and noticed the print was… small. Sigh. C’est la vie. The small type was compensated by lots of fascinating pictures and many big ideas. It is the perfect kind of book to read before visiting a city– especially Paris. 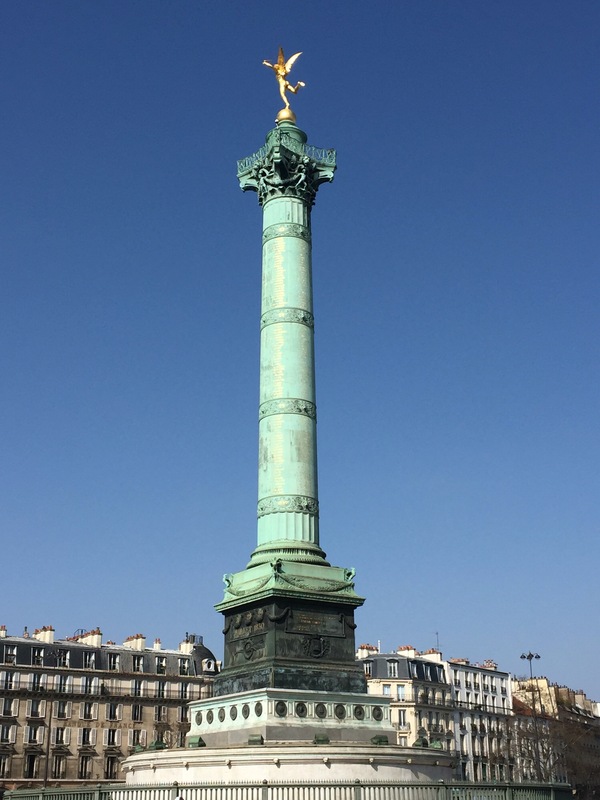 When I think of how Paris became Paris, I think of Baron Haussmann and Napoleon III and the tearing down of old Paris and building the one we know and love today. But DeJean takes us out of the the 19th century and firmly places us at the dawn of the 17th century to show us how Paris went from a cramped, dirty hovel to being the City of Light that set the trend for how all cities should be. Baron Haussmann just improved on the design. We take for granted everything that makes a city a city: public spaces with park benches, promenades along river fronts, places for people of all classes to mix, streetlights, distinct neighborhoods, the sense of style, shopping, and postal service. This mode of living is commonplace to us now, but four hundred years ago they were a part of a French revolution: a revolution on what it means to live in city. This was not a grassroots movement as it stemmed from forward thinking monarchs who realized that Paris itself could be a crown jewel and a reflection of their status as rulers. The Pont Neuf bridge serves as a metaphor for the effects of all of the Parisian innovations. Built in 1604, it defied the typical bridge purposes by being made of stone instead if wood and not having any homes or stores built upon it. It was a connection between places, with nature, and ultimately, with people. Traversing the Seine through the the Ile-de-Cite, it was built to allow both carriages and people across. The stone construction allowed for heavier cargo and brought more trade through the city; to allow pedestrians safe passage, it included new raised paved walkways. This design was so new that there wasn’t a word for it. Today we call them sidewalks. The lack of buildings encouraged the public to stop during their walks and enjoy the view of their meandering river. Parisians flocked to this bridge; it became the epicenter of news, performances, commerce, and a place to just be. People from all walks life could meet together, to see and be seen. Each innovation, in its own way, succeeded in this endeavor. The open spaces of the Tuilieres and Place Royale, the quais along the riverfront, expanded paved roads, mixed use buildings all brought people together. The use of streetlights enabled people to stay out after dark with less fear of crime; shops and cafes stayed open later. Since it took its counterparts in other countries almost a hundred years to fully implement lighting, it gained its moniker “City of Light”. As Paris became the fashion capital, newspapers and the advent of fashion magazines and fashion plates helped export Paris to the world. Plate glass windows, textiles, and a new level of commerce brought about boutique stores and a new hobby called shopping. Visitors from around Europe flocked to Paris to partake in its unique, cultured city life, and other cities worked hard to catch up to its modernity. 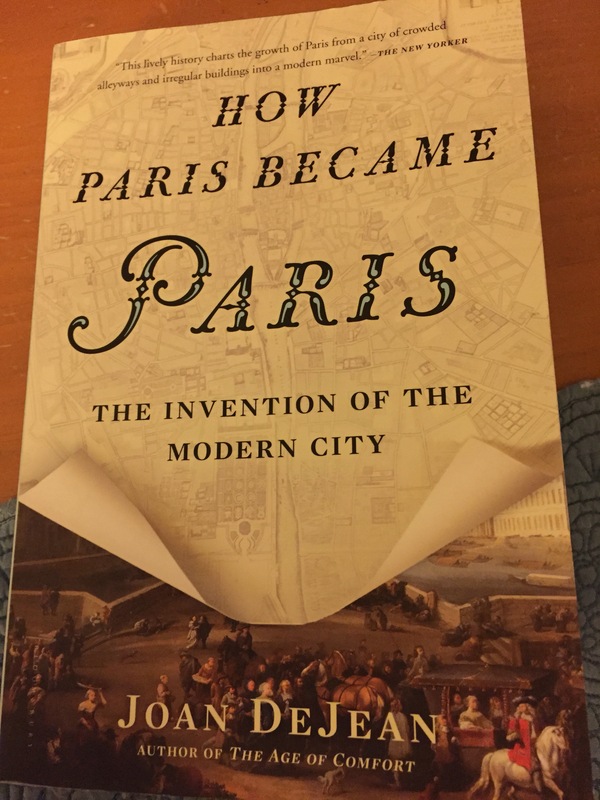 How Paris Became Paris is not just an enjoyable read for anyone heading to that city, but for anyone who is interested in how civilization turned the corner from Medieval life to the modern world. For this traveler, I look forward to enjoying the sidewalks, the boulevards, the bridges and parks, knowing how these simple daily pleasures helped transform the world we live in. “Hey, Ms. L, are you going to see Pride and Prejudice with Zombies?” my student asked. This is a much asked question as all of my students, family, and friends know how much how much I LOVE Jane Austen’s P&P. Not as well known is how much I do not like zombies. It is a trend that I wish would finally die already. Along with vampires, werewolves, ghosts, and all the others. “I just want stories of ordinary people dealing with ordinary life,” I replied at the end of our conversation. My wish was granted in Colm Toibin’s novel Brooklyn, a coming-of-age story about Eilis Lacey, a young woman who leaves her small town in Ireland in the 1950’s to seek better opportunities in Brooklyn. What it lacks in the brain-eating undead or the repartee of Elizabeth and Darcy, it makes up in quiet reflection as Eilis navigates her new life, customs, and people as she finds both love and herself. Like her ocean voyage from Ireland to the States, her path to adulthood is fraught with undercurrents that threaten to keep her off-balance. Toibin centers the novel on the daily details of Eilis’s life and her weighing of each new experience for what it means and determining what kind of life she wishes to have. She wrestles with her choices, their consequences and effects on others. My Goodreads list reminded me that I have read other novels recently about ordinary people: Jojo Moyes’s Me Before You and Chris Cleave’s Little Bee, and it made me wonder why Brooklyn resonated with me so much more. Both novels connect to Toibin’s theme of life and how to live it. Me Before You is an immensely readable novel about Lou Clark, a character similar to Eilis in that she is used to living a small life but is thrust into one greater as she begins working for Will Traynor, a quadriplegic. Will makes Lou question what she want out of life as he himself has decided what he wants from his. Of course, romance ensues. Such stories can easily be made saccharine and sentimental, but Moyes keeps the reality centered in the daily routine of caring for a quadriplegic and the physical struggles quadriplegics face. Nothing comes easily for Lou as she makes many of the assumptions about quadriplegics the reader would make. Nothing comes easily for the characters in Little Bee either. The main character, Little Bee, escapes to England from the war in Nigeria and searches for the only people she knows there, a couple who she met on a beach years before. Little Bee’s arrival changes the couple’s life forever, especially for Sarah whose purpose in life has gone astray by her previous choices and consequences. Chris Cleave can write beautiful prose, but it seemed like he was trying very hard to be profound and show that the affects of war on children is an issue. It may have also been the fact that I read Ishmael Beah’s A Long Way Gone: Memoirs of a Boy Soldier and had watched Beasts of No Nation, unflinching and immediate accounts of child soldiers in African wars, right before I read Little Bee. The cards were stacked against him. So what is it about Brooklyn that separates it from other novels about ordinary people? It is, I figured, about ordinary events. Eilis doesn’t have her life changed by a quadriplegic or by war; she immigrates to America. While many of us have not moved from one country to another, many of us have moved to areas vastly different from where we’re from. We have had to learn new ways of doing things, meet new people and determine them to be friend or foe, experience different weather patterns, figure out how to fit in in ways that are authentic to us, and suffer from homesickness. If we return to the place we called home, we see it with new eyes and have to ask ourselves if it is really home anymore. Does it reflect the kind of life we want to live? Are its values our values? At some point we have to come face to face with ourselves, that we are not the same person who moved away. We had to stand on our own two feet and prove ourselves and come to terms with life and how to live it on our own. In the end we learn how to make our own lives a little less ordinary. London’s Tube reminds us to “mind the gap” so that we may get from St. Pancras to Green Park with our life and belongings intact so we can enjoy a soft serve with Flake as we stroll to Buckingham and then through St. James’ Park. The gap between the train and the platform is obvious; we see it. But gaps exist everywhere and are not acknowledged. Currently I am experiencing a watercolor gap. I’m teaching myself how to paint and have watched many beginner tutorials on YouTube, but they all start with painting a picture, and the host starts painting away describing his technique while the brush disappears and reappears on the screen with fresh paint. The gap is what happens off-screen: What kind of paint is he using? How much water does he use? Is he blending colors? This is common knowledge and routine to him, but not so much for me. I would really like to know the paint to water ratio. Even though I paint pictures anyway and am developing my own unique “style”, I know that there’s a lot I’m missing. This is true for traveling. There are those who want to get away but just aren’t sure how. Let’s be honest: planning a trip can be daunting and for many travel is limited to a finite amount of time and is a big investment. How can they best spend their time and their money to gain a priceless experience? Fortunately there are many resources out there to help a budding voyager get from point A to any where on the map. I am fortunate enough to be from a family that values traveling. I have clear memories of reading the AAA hotel and dining guides like novels, my mom teaching me how to read a map, and many family adventures that allowed me navigate new places. I learned to make the most of small towns and conquer big cities. However, it wasn’t until I was in my early thirties that I felt like I was a traveler. In 2010 my friend Jessica and I decided to hike the Cotswold Trail in England. I had been overseas once before for a school trip, but I didn’t have to do anything for that except show up. This trip required research and preparation. It was daunting; it was intimidating; it was empowering. That trip taught me two things: how to do it and that I could do it. Know Thyself. What do you enjoy doing? What do you want to see? Experience? How far are you willing to push your comfort zone? What is the purpose of your trip? What is your mobility? When Jessica and I decided to go on a hiking trip overseas, we had to assess our comfort level. 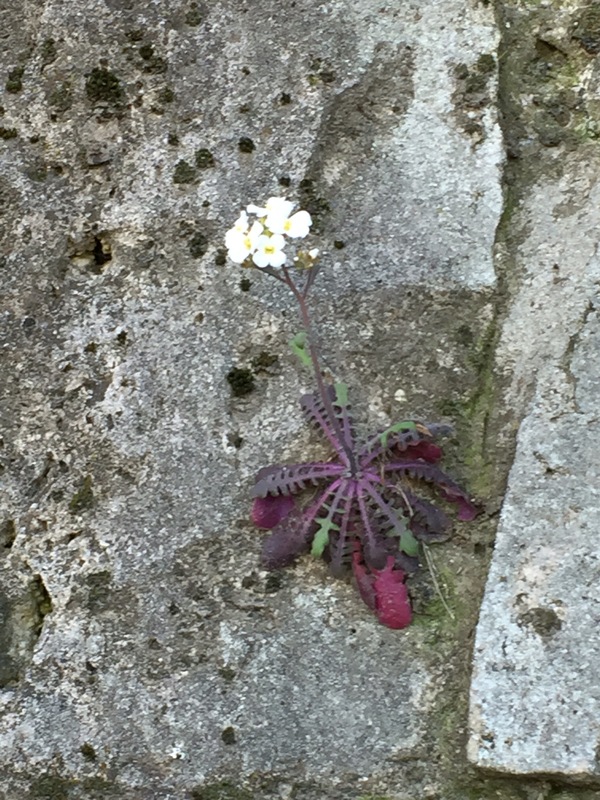 We knew we were going to be out in the boondocks where we might get lost and need help, and to mitigate our nervousness, we decided that we did not want to face a language barrier. Hence, England. England is a hiker’s paradise; there are a multitude of trails spanning the country. We knew that we would be hiking for about eight days, and since we are not hard-core hikers, we chose the Cotswolds. In the Lonely Planet guide to British Hikes, the Cotswolds were ranked as “moderate” (which does not equate to the American meaning) and that we could hike from pub to pub (and we earned our ale). The Cotswolds also appealed to our love of all things British: sprawling countryside tucked with little villages and steeples; hedgerows and sheep; charming stone houses with thatched roofs; cosy pubs with hearty chowders and oversized utensils; English breakfast replete with broiled tomatoes, mushrooms, and beans on toast. Because we knew our abilities and what we wanted to get out of the trip, we had a great time. Know Thy Budget. This is huge. How much money do you have to travel and what do you want to spend it on? Again, research is key here. If you are planning a trip, start looking at how much airfare is, the going rates for hotels, transportation, and the cost of things in general (for example, you can go to TripAdvisor and look up restaurants in your destination, read their menus and look at the cost of food and drink). Start doing a realistic estimate of how much it’s going to cost you and think of the things you might want to buy. Then start saving. Jessica and I had ten months to plan for our trip. Looking at airfare, bed and breakfasts, transportation, food, and the supplies I had to buy beforehand (boots, a pack, hiking clothes, special socks), I estimated what I would need, divided it by ten, and I saved that much more extra each month. When all was said and done, I didn’t need as much money as I thought I did, but my trip was paid for ahead of time, I didn’t have to worry about finances during the trip, and I learned that I could save for travel. On the trip Jessica and I didn’t live large. We found ways to stretch our pounds: we shared a room and split the cost, B&Bs provide breakfast, and we found a clean budget hotel in London. But we had everything we needed, and when I found a hand-crafted wooden clock made from the wood of a yew tree by a local craftsman, I bought it. Know Thy Resources. We live in a great time for travel. We have the internet, Pinterest, Uber, and Airbnb. Traveling has never been easier, but you have to know where to look. One of my favorite things lately is to google flights. Literally, type in “flights from Amsterdam to St. Petersburg” and google will pull up the cheapest flights for you. If you go to the calendar, you can see the cheapest flight everyday for months. How cool is that?! You cannot book through Google, but you can go to the airline’s website and book there. Pinterest is not only for arts and crafts; it also allows you to get crafty with your travel plans. Type in your destination into the search bar and all kinds of articles about that place will pop up– even for places as far flung as Bishkek, Kyrgyzstan. Uber was a life-saver in New York during peak taxi hours on a Friday night, and can easily get you to where you want to go. And Airbnb has revolutionized the way that I travel. Trips that would have been out of my budget because of hotel costs were made feasible by Airbnb. 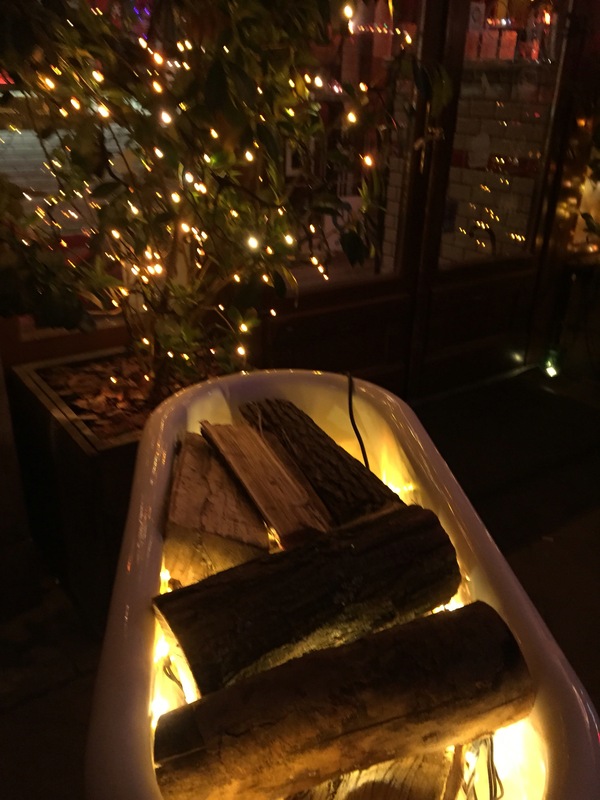 I stayed with a couple on the Upper West Side in Manhattan for $76 a night– unheard of in that city. The hubs and I stayed in apartments in London, Paris, and Rome, where we had a kitchen and laundry facilities for way less money than a hotel. I have used it in Savannah, St. Paul, Cambridge, MA, and Washington, DC. Next month I am staying in a room in Budapest for only $43 a night– and it includes breakfast. Again, though, the key word is research. Make sure the place will suit your needs and location and read the reviews. If it doesn’t feel right, then don’t book that particular place. So here they are, some of my tips for planning a trip. Travel can be daunting, but it is also a great time to spread your wings, challenge yourself, and see the world. Readers, what are your travel tips?